There seems to be something in the air up here. It seems I've only just put all my overnight gear away and it's suddenly the end of the month with my planned monthly bivvy/camp not yet ticked off. With that in mind, and the desire to get in a decent cycle, I opted to explore a mostly off-road route from Aviemore down to the sea. I'd tried the Speyside way before but I knew I simply couldn't face all those gates and, in any case, it's always good to explore. So, I opted for the Dava Way this time. Like much of the Speyside Way, this follows the track of an old railway bed. That means gentle gradients and often little architectural delights. It's a good spin. Pretty easy miles and through some gentle, rolling scenery usually away from the roads but with occasional loops towards them in the event a change of plan is required. Aware of it being a long night in November, I left after lunchtime, planning to ride the last few miles in the dark. This is all part of my "training" for the Highland Trail 550 in May and it's good to be able to assess lighting and comfort when there's nothing much at stake and I'm in no hurry. From home to Grantown on Spey, I stuck to the Speyside Way. This has a few gates at the Grantown end but nothing to slow me down too much. Through Grantown and it's straight onto the 24 mile Dava Way. There are a couple of minor detours of the railway bed but mostly it's just a case of spinning along. Reaching Dava itself means it's basically all downhill to the coast and I reached the forests on the outskirts of Forres just as it started to get dark. I got a bit of a shock when I reached the High Street as it's been closed to traffic and the Christmas Market is just finishing. Thoughts of grabbing something in a cafe or from a chippy were put to one side as everywhere is completely packed and I then decided to head straight to Findhorn and take my chances there. On the way, I passed Sueno's Stone and took a couple of photos. It looks fantastic lit up in the dark night. In fact I think the relief-work is enhanced that way. Leaving Forres along Findhorn Bay I was exposed to the strong Westerly wind. I'd been mostly sheltered from it before and I was suddenly aware that I'd be a wee bit exposed in my tent tonight. In Findhorn, I found the Kimberley Inn. It looked lovely and welcoming so I was in like a shot for some food and a beer (or two). Again, I was in no hurry to leave as it would be a long enough night in any case. Finding a pitch on the beach turns out to be fairly tricky. I was trying to find a sheltered enough spot with a view of the sea and with some sort of soil able to take a tent peg. After much searching around, I eventually found somewhere and tried to get settled in for the night. However, it wasn't long before one wall of the tent came crashing in and I was out again, trying to sort things out. Eventually, I moved the bike upwind of the tent and lay it down on the sandy soil. The three guy-lines were then attached to the bike and - lo and behold - the tent was finally stabilised. A wee dram or two completed my night and I was soon asleep despite the roaring of the wind. A mid-night pee break had me scurrying out of the tent for a few minutes into a complete, flat calm and with the wind having died right down I was also feeling the heat a bit so left the zips open for some extra air when I got back in. Early morning and the wind had returned. Still, I made the most of breakfast before packing everything quickly away and heading back the way I'd come the night before. I was expecting the return trip to be quite a bit slower and harder work as I was now fighting the headwind all the way but despite this, and the fact that I was generally trending uphill all day, I actually made good progress and had enough time to stop in Macleans Bakery in Grantown on Spey for a bit of lunch. In total, I covered over 140km and took around 13 hours over the two days. Thinking about this, I reflect that I'll need to do that sort of distance every day, for 8 days in a row and over much rougher terrain if I'm to complete the Highland Trail Race in May!! I've never been much of a competitor - not in sports anyway. As a youngster I had neither the skills for the likes of football nor the fitness for anything more athletic. My participation in cycling has, almost always, been for relaxation, for enjoyment and for simply enjoying the outdoors. However, back in 2007 I was persuaded to take part in an event called 70 Wild Miles. This is/was a triathlon set around the Glencoe area that would involve me only in the cycle part - a 47 mile ride from the Grey Corries to Taynuilt. I can't deny that there was a frisson of excitement as I pinned the number to my jersey and stuck one on my bike. It was a nice ride, though I struggled on one particular climb, and I gave it my all approaching the finish line. Looking up the timesheets later that night confirmed that I had done "OK", but plainly there were a lot of folk better trained and fitter than I was. The event was primarily about fundraising but it had started a little spark in me to see what else I might be able to compete in. Fast forward a year and I found myself back at the Grey Corries to do it all over again. This time, I'd actually put a bit of effort into a training plan, I'd even bought a lighter/quicker bike. Again, I rather enjoyed the experience and, but for a handful of seconds, the team I was in would actually have won the event. With a bit of enthusiasm now, I joined a group of internet-based buddies to do a wee bit of off-road racing in the Sleepless in the Saddle event. To be honest, I was cursing the guy that talked me into it as rain turned the track into a muddy slop that left me carrying the bike round the nine mile course for over two hours. 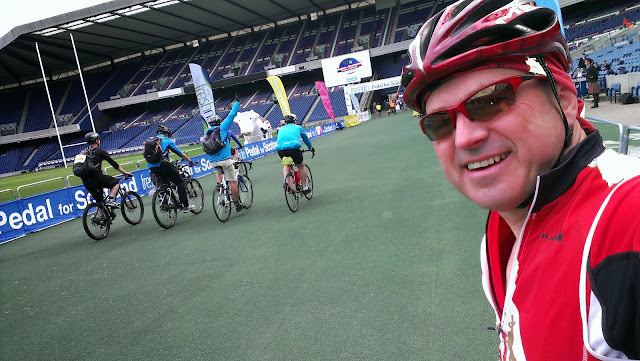 Other than that, I've taken part in a few Sportives. These can hardly be classified as races, though many riders take them very seriously indeed. I find they can be a great way of meeting other riders and, on the busier events, the sight of someone a little ahead of me makes me work a wee bit harder just to catch them up. My goal with any Sportive has been just to finish in the top half of the field and I've been able to achieve that. One event that many folk have asked me about is the Strathpuffer. I've often considered it and even went to help out a friend one year. However, the idea of riding round a forest for 24 hours, in January, mainly in he dark and with the risk of snow, ice and/or mud hasn't quite grabbed me enough. So - fast forward to 2013 and what have I done? I've only gone and entered a mountain bike race. However, this is a race like no other. This is 560 miles through the Scottish Highlands, unsupported, in the manner of an Individual TIme Trial - http://www.highlandtrail.net/ I have no doubt whatsoever that this will be, by far, the toughest thing I've ever done. To put it in perspective, my Lands End to John o'Groats ride was 10 days of around 100 miles but with a comfy bed each evening, food provided and with luggage all carried for me. For the HT550, I'll be carrying my food, water, bedding, clothing etc and I'll have to do 70 miles per day regardless of how much of that is walking and carrying or pushing my bike. To say I'm apprehensive would be a massive understatement. A quick calculation shows that I have six months to get fit, develop my "camp-craft" and work out what kit I'll need and how little I can get away with. With a fall-out rate of almost 50% in last-years inaugural (though shorter) event I'm going to be very pleased just to make it round in the 8-day cut-off time whereas the fast guys (like Mike Hall - current record holder for the unsupported circumnavigation of the globe by bicycle) will likely do it in 4 days. Sounds like I have two challenges to manage into 2014 then; get ready for the HT550 and yet not lose the fun and relaxation that I normally associate with riding my bike and camping. Expect this blog to be full of anguish, head-shaking and sheer panic for the next six months!!! In an effort to resuscitate my relationship with Scotways after a summer in which I've neglected my route surveying - and with a bit of a more selfish wish to follow through on an old project of my own - I recently cycled the old military road from Aviemore over the Slochd to near Tomatin. I'd already been over a bit of the route a few years ago and was always fascinated by the sight of the old road at my start and finish points. For those that are unfamiliar with the military roads in Scotland, a bit of background; they are often attributed to General Wade who was tasked with improving the lines of communication in Scotland after the first Jacobite rebellion. He was followed by Major William Caulfield, whom history has rather forgotten. Of course, other older - and newer - military roads also exist and both Wade and Caulfield were often happy to use existing routes through the Highlands as a base for their roads. My introduction to these old roads was via my father who would often tell us when we were driving along sections that have now been used as the alignment for the modern roads. Most folk who've driven anywhere in Scotland will have been along one section or another, especially if you've ever been on the A9. He was always fascinated by their "antiquity" and I guess he passed that on to me. Of course, being a keen walker and cyclist, I've been able to find more sections than he ever knew existed. One of the issues with 300-year old roads is that most have gradually been over-laid, dug up, planted with trees or built on. It's therefore great to come across a section that is still largely intact, or at least where the existing line is both visible and can be followed on foot or on bike. As the section nearest Aviemore is now split by the A9 I headed onto the Wade Road from the access track to Kinveachy Lodge. the old route is plainly visible, though now barely used. Like the Romans before him, Wade was keen to follow straight lines where possible so while he new track winds up in a couple of bends, Wade just goes straight up the hill. By paying close attention to the map I found the first confusing junction and headed further uphill, further away from any traffic noise. From here, the road carries on over some lovely, lonely countryside now bypassed by the more modern re-alignment of the road through and past Carrbridge. The route is briefly shared with an off-road alternative to National Cycle Network (NCN) route 7, including the use of the bridge at Sluggan. The beautiful Sluggan Bridge. Not Wades - he just forded the river. This was Caulfields work. Where the two diverge at Insharn, the Wade route has a short, steeper climb through a bit of forest before coming out higher up and presenting an open view of the Slochd. Ah - here's a typical Wade bridge near Slochd. A short descent over the Inverness-Perth railway line brought me back down to the old A9 and then it was a bit of a wait getting across the new A9. Up until this point, the track has all been easy cycling so I was looking forward to the last few miles down to Raigbeg. It all started easily enough, with a new track joining up with the alignment of the old Wade Road near one of the numerous marker stones that infrequently mark the route. Marker stone. One of many on the route. Those travelling South would have had their first view of the Cairngorms from here and I can imagine the mix of awe and dread at seeing this during winter. Snow-capped Cairngorms in mid October. The track here is now used for access to a telecommunications mast so is in good condition as it crosses the spine of the hill, away form the noise of the traffic on the A9. Shortly though, the Wade Road becomes not much more than a depression in the heather. The line of the road is just visible but wider tyres would have been preferred. I managed to cycle most of it - through wishing I'd had the benefit of the Fatbikes 4" tyres - but it eventually defeated me as the depression got deeper, the ground got softer and the gorse got thicker. A short diversion onto the shorter heather alongside got me almost all the way down to Raigbeg where the old road re-asserts itself at another marker stone. From here, it's a short ride down to the houses at Raigbeg and along to Tomatin. For those looking to sample some of this for themselves, the complete route description can be found on the ScotWays Heritage Paths website here. With all the recent rushing around, I almost missed out on my bivvy-a-month for September. Luckily, there are lots of spots close to home that are an easy cycle away so I set out at 9pm on 30th Sept to bash in a few miles, heading for a spot I'd attempted to camp in earlier in the year. On that occasion, I had the tent with me and a combination of frozen ground, snow and springy heather made me abandon that pitch in favour of somewhere else. This time, I was better prepared as I was simply taking a bivvy bag, mat and sleeping bag. The 22km cycle to the top of the hill was marvellous. Leaving the lights of Aviemore I passed Loch an Eilean and headed for Feshie Moor and the Uath Lochans. The mostly wide, dry tracks were interrupted by the sweetest singletrack by Loch Gamhna and I was on a real high by the time I started the steep climb to the bivvy spot. Casting around for the exact location I'd visited earlier, I noticed that the summer had brought on the birch trees a bit and that I'd subsequently have little view. However, just a few yards away was all the view I needed and it was simply a case of unrolling everything and climbing in before my sweat started to chill. A beautiful star-filled sky indicated a likely drop in temperatures and since it was already after 11 I made do with a wee celebratory drink from the hipflask before tucking right into the bivvy bag and dropping off to sleep remarkably easily, proof of how tiring the last couple of weeks have been. I inevitably woke up a few times in the night but didn't grudge any of them as I was able to watch the moon rise and the stars multiply before catching the first pre-dawn glow over the horizon to the north west. As it got brighter, I reckoned I'd head home for a decent breakfast so gobbled down a Clif bar, packed everything up and made my way back towards home, arriving back before 8:30. Less than 12 hours outside, but seemingly a whole world away. This trip was a perfect example of the advantages of a bivvy bag over a tent. The ability to choose any spot to sleep rather than being constrained by tent pegs and pitching area gives a whole new flexibility and those brief moments of lucidity through the night give a chance to see the world changing around you more than the inside walls of a tent ever can. Any weight advantage of the bivvy bag is just an added bonus. Mind you, that might be it for the year. There's something very cosy about a tent when the weather gets very chilly and it's raining or snowing and as we head into the last three months of the year, I'm sure I'll be glad of that. After a few delays and false-starts, it's finally happened - I've moved to Aviemore. A move north has been a bit of a dream for a few years now although I had no definite destination in mind. Once we started looking round, we realised that Aviemore and the Cairngorms had almost everything we were looking for - after all, we've been coming on holiday to the area for years! House removals were done with a bit of help from friends and a few trips in the van. However, I was careful to leave one bike behind as I intended riding up. With everything else done, I had a trip to the estate agent to drop off a set of keys so headed for Edinburgh in the van. Having attended to that duty, I had dinner and drinks with Mark then set off for "home". It was a bit weird sleeping in an empty house with just a sleeping bag on the floor, especially when the house had recently been full of my belongings. I slept OK though and was up at 6am for a quick spot of breakfast and coffee, then dump the last of my stuff in the van and park it in the street. That left just me, a bike and a minimum of kit to set off just after 7am. With a lengthy downhill start, I was well wrapped up and soon scooted down towards the airport just as the sun was rising over the Pentland Hills. A short spin later and I was on the Forth Road Bridge, slightly amused at the sight of all the commuters heading to work. The section across Fife wasn't as tedious as I'd remembered it. Maybe it was just the weather doing its part. By the time I reached Kinross, I was ready for a bite to eat and remembered that I'd previously eaten in Cafe 39 on the main street. Once again, it did not disappoint and I set off replenished for Perth which has always been a significant waypoint for me going north as I feel it is where the Highlands start. I'd given some thought to what route I would take out of Perth. The most direct approach is to use the cycle path alongside the A9 to Luncarty and then jump on to the main road for a while to Bankfoot. However, being in no particular hurry, I opted to take the signposted NCN77 which was a bit hillier but was pleasant nonetheless. I was already thinking about a second food stop but opted to bypass the Perthshire Visitor Centre at Bankfoot as I'd been in there so many times recently on my various travels to and fro with furniture and other belongings. Howies Bistro in Dunkeld served up a great coffee and a cream scone to fuel me on the next stage where I had once again opted to stick with the main NCN cycle route. This starts by heading past the hotel and a rather rough forest track. Still, at least it wasn't muddy and the 28mm Marathons coped with it just fine. From here to Pitlochry it's all quiet roads and once Logierait was reached I was on familiar ground as I'd cycled this as part of the Etape Caledonia. The hills along here weren't as bad as I remembered. Perhaps it was the gearing on the Amazon or that I had just been taking things a bit easier up to this point. A brief detour in Pitlochry took me to Escape Route Cycles. I'd been hearing the noisy grinding of my chain all morning and my mechanical sympathies forced me to buy and apply some chain lube. I also bought a spare Powerlock chain link. I'd noticed I'd somehow forgotten to pack one and it had been praying on my mind all morning. With the prospect of the path over Drumochter to come, I thought it was best to correct that oversight. In Blair Atholl roughly on schedule, it was time for another food stop to provide some reserves for the next, exposed, section. The Watermill was fairly quiet (for a change) and I had an excellent bagel. The warning at the start of the cycle path in Calvine is a little over the top!! From here, it's a steady climb up to Drumochter Summit and for much of the ride you are far enough away from the A9 that you can enjoy the old road. Once Dalnacardoch and the "new" cycle path are reached though you are constantly aware of the traffic. Symbolic milestones passed quickly along here. With just over 100 miles done, I passed the hillside that marks the geographic centre of Scotland. After 7 hours of cycling, I could really say I was now in the North of Scotland. A little later, it's the high point of Drumochter Summit and then, finally, the signpost indicating the start of Highland Region. I was actually a little emotional at this point. After years of being a visitor, here I was on my way to being a resident. It's like a dream come true and I really felt that I'd followed my heart to be here. Ironically, given I was supposed to have left the traffic of the "big city" behind me, I was rather surprised to see the road completely stopped up, with cars sitting, engines switched off in some sort of road closure. As I whizzed along the now mostly downhill cycle path I received various jealous comments from car, bus and lorry drivers. Luckily, the accident that had caused the closure hadn't resulted in any fatalities (this time) and the road was being cleared just as I passed the spot. I was more interested in the way forward and, as the light started to fade, drew into the Ralia Cafe for a final rest, coffee and food. With so little distance left to travel, I was happy to take my time. I'd thought about rushing along to beat the sunset but I've really taken to riding in the evenings and in the dark so I was happy to see the sun dropping below the ridge of hills, switch the lights on and head through Newtonmore and Kingussie. It was all feeling quite effortless now, spinning along in the twilight and thinking of the fact that I was actually heading home. By the time I saw the lights of Aviemore I was feeling quite elated. So, that's it. After 50+ years of living in and around Edinburgh I've finally relocated. The house isn't the wee, rural cottage I'd imagined but having weighed up all the options we have a terrific location, great views and so much on our doorstep. No wonder we've returned to the Cairngorms time and time again. The one downside is that we'll have to find somewhere different to go on holiday!! Re-organising my life around a move north carries on apace. In the meantime, I've been looking at the calendar and wondering how I can fit in Augusts bivvy-a-month. It was clear it would have to be a time-constrained effort and that really meant local. As a bonus,that would give me a chance to try somewhere that's been on my mind for some time. So, after dinner on Sunday night, I threw a sleeping bag, bivvy bag, a couple of snack bars and the ubiquitous hipflask into the Viscacha saddle pack and headed off up the Pentlands. As I rode along, the evening sun was just setting behind me so I stopped for a quick photo. I arrived at my destination, Allermuir Hill, just before 9pm and found an ideal little spot where a semi-circular ring of stones had been formed into a low, crude shelter. The centre was still grassy so I knew I'd be comfy enough even without a sleeping mat. Having arrived slightly sweaty, I was now beginning to cool down so, spreading out the bivvy, I slipped into it and started to warm up while watching the street lights below. Before long, i began to see the sea haar spreading in off the Forth, casting a weird spell on the capital city, gradually extinguishing the lights and leaving a glow instead. Those who decry the use of a bivvy, preferring a tent (I was one of them) are missing something. How often have you sat in one place for three hours, just watching nature takes its course? While I sat here, the moon rose, the haar waxed and waned and gradually the stars popped out. Eventually, tiredness caught up with me and I nodded off to a lovely sleep. I woke up a couple of times in the night, to turn over or adjust my body "just so" to avoid a rough patch of ground and I was aware of the mist having slid up the side of the hills to wrap me in damp air. When I woke to find the sky a bit lighter, I decided to get ready to head off and managed to catch the first rays of the sun as it rose through the mist. Thankfully, the mist also started to recede off the hill tops, leaving me with some stunning views of Edinburghs high points poking out. As I turned away for home, I was aware that I was gradually letting go of Edinburgh and the Pentlands, where I've done so much riding these past few years. It's still pretty amazing that we are blessed with an area of relative wilderness so close to the city and that it has survived the explosion in recreational use. Here's hoping it stays like that and that I'll be back to enjoy it before too long. As the countdown to our move north carries on, I find myself looking even more intently at maps of the local area, identifying routes and trails I've never quite got round to following. It's a remarkable testimony to both the Scottish land access laws and the flexibility shown by the land managers that the network of trails continues to expand. Some fairly recent additions can be found at the Southern Uplands Partnership website. These trails have been marked and delineated primarily for horses and riders but they are also suitable for walkers and cyclists. Using some of their maps I was able to piece together a mostly off-road route between my home in Balerno and Peebles in the Borders so I thought it would be fun to use this as a way of visiting the 7 Stanes centre at Glentress. The first part of the route was completely familiar as it took me over the Pentland Hills to Ninemileburn, Carlops and then to West Linton. From here, it took a bit more map-reading and signpost-spotting to locate the preferred route to Newlands on the Edinburgh-Moffat Road. Truth is, some of the route hereabouts is downright awkward and I had to avoid one small section as it was shoulder-deep in brambles and nettles. The other issue is that it often follows field margins and so has lots of gates involving constant dismounting of the bike. After Newlands the route enters the Cloich Hills. This was all new terrain to me and despite a couple of questionable route choices - where the signposts didn't seem to match the map - I was soon in some very lonely glens. It occurred to me that these were, in their way, even more wild than some of the areas up north on account of the very low number of visitors and that a fall or injury might leave me lying here for days, or even weeks, before being discovered. Despite a few route alterations, I was soon overlooking Peebles from a very unfamiliar position. I then decided to take in a little of the Glentress MTB trails so headed up Janets Brae to the Buzzards Nest area and down the red/blue descent. The El Mariachi felt pretty good on these fast trails with a bit of gravity to help it gain speed. Sitting in the Peel cafe at Glentress, enjoying the macaroni cheese, milkshake and coffee I'd ordered I was struck by how late in the day it had become and by how far I'd now have to travel home. With that in mind, I didn't hang about long and opted for what I thought would be a faster route. With a little road work up the A703 and then on to some minor roads it wasn't long before I was back in the Cloich Forest, with a whole different set of views. I've always thought that one type of riding we were lacking near Edinburgh was these long forest roads, and now I'd found loads of them in this small area. I'd thought about using the roads to get me back to West Linton again rather than suffer the interminable series of gates I'd endured on the outward route but I persevered. It was supposed to be moutain biking after all! In West Linton itself, the little Co-Op was still open and that proved the perfect opportunity to pop in and get some cold drinks before the longer off-road section ahead. Popping back onto the roman road towards Carlops I was once again on familiar territory. On the climb up Monks Rig the combination of slope and headwind proved too much for me and I resorted to pushing for a little while until the gradient eased and I could get back into pedalling mode. Overall, a great day out and that lovely sensation of returning home just as the sun sets - a sure sign you've made the most of the day. As for the trails, I thoroughly recommend them. Take a map, be prepared for a few diversions and don't be afraid to wander and explore. Who knows what you'll find. This seems to be my year for trying out new ways of enjoying the outdoors. This time I found myself wanting to see how my endurance and stamina were doing. This was all brought about when I started to follow an "event" called the Highland Trail 400. This is a self-supported mountain bike route through Scotland. The theory is that anyone can set off to do it anytime they want, but in May this year a couple of dozen riders set off to do it as a race. I was initially very sceptical about this; something about racing through the lonely gems just jarred with me. However, as the start day approached I found myself getting increasingly caught up in it. What made it even more fascinating was that the competitors were carrying Spot Tracker devices so that their progress could be followed by folks at home. For the 5 or so days it took, I found I was constantly updating the website, keen to see how they were getting on. What became very apparent is that most of the riders were surviving on very little sleep, riding well into the night and getting up at dawn. What's more, they were obviously pitching up in all sorts of unplanned locations. Now, to me, this is a complete anathema. My various trips are planned out in military fashion. Ride times are calculated, maps are studied, overnight locations are carefully chosen and very, very seldom does it involve riding after dark. Another difference is that these folks were going out much, much less laden than I would with kit stripped back to the minimum. With a few days of warm, dry weather promised I thought this was the perfect time to try out this more unplanned approach. I'd already started to consider some of the challenges. I thought I'd stick to the roads for this first attempt and instantly had a route in mind. I bolted on an extra water bottle cage (nowhere to fill up overnight) and took enough food to get me through the 12 hours or so between opportunities to shop. My overnight kit was basically reduced to a bivvy bag and a sleeping bag. I reckoned I'd be too warm and dirty for the latter but at least it might provide a cosy mattress. Heading out of the station at Carlisle I was once again into the land of NCN signs. It seems that every spare sign Sustrans had ended up here and they point everywhere. This'll be the third time if cycled from Carlisle and I'm still no clearer as to the best route out of the station. However, I soon locate the route North and arrive at Gretna, safely back in Scotland. Last time I was here I headed East across the borders, this time it was all the way West and I opted to follow NCN 7 as it ducked and dived through various stretches of farmland and campsites. It's slower than sticking to one main route but I reckoned my planned overall average of 15kph wasn't going to be affected, despite the occasional missed turning and short back-track. The day was heating up too. I was aware of a mild tailwind that made pedalling slightly easier but this also served to keep me warmer than I'd have liked and it was with some relief that I reached Dumfries for a quick food/drink stop. The only problem was finding somewhere cool to eat and I eventually plonked myself under a tree in a car park. The section to Dalbeattie is one I'd cycled previously as part of a sportive. The major change in the scenery here is that Criffel, having been the commanding landscape feature all day, is now hidden and the road meanders more following the coast. I was happy to see the campsite at Sandyhills for an ice cream, a cold drink and a water-bottle top-up before carrying on into more unfamiliar territory again. Just before Dundrennan, I spotted some going on in a field. It turned out to be preparations for the annual Wickerman festival. Passing through Kirkudbright I was beginning to think about food again. I didn't want to miss an opportunity for a decent meal but I didn't see anything that really took my fancy and as I set off West again I was dreaming of a country pub. As luck would have it, that's exactly what I discovered in the little hamlet of Borgue so I was able to kick my feet up for a little while and enjoy some chat with the owner over a spot of food. I was now heading into more unknown territory. Not in a geographical sense so much as a psychological one. With the sun slowly setting and nowhere planned to stop I was beginning to feel a little uncomfortable and started setting some interim goals in my head. The first of these was to decide on a route beyond Gatehouse of Fleet. There are three options here; the first is to stick to the coast as closely as possible. That means the A75 and with warnings from the owner of the pub in Borgue still in my head I decided that wasn't going to work. NCN 7 takes a leisurely diversion to Creetown, sticking to the valley on a quiet road. However, I had been intrigued by a middle way - the Corse of Slakes Road. This is an old military (though not Wade/Cauldfield) road that took to the higher ground. My curiosity being what it was, I opted for this and made my way uphill to Anwoth Church. I was then faced with a rapidly deteriorating surface, a sign saying "not suitable for motor vehicles" and a couple of gates, one of which required a lift over. This wasn't what I'd expected at all and as I made my way along I was already contemplating a strategic withdrawal. However, despite the lack of grip and suspension I teetered along until it eventually caught up with another tarmac road. I'd hoped for some great views up here but the surrounding hills were just a little close and I pressed on reaching the fast downhill into Creetown. I was relieved to have got this section over with just as the sun was finally setting and then NCN 7 then put in a re-appearance to provide a good route into Newton Stewart. I made it here at 10:15, just minutes before the filling station closed for the night. That made it possible to have another snack and a final take on of fluids. It also gave me the opportunity to fit the lights that would be needed until I decided to stop. This next, night-time, session was actually one of the most enjoyable of the whole trip. It was cooler - though I was still only wearing a short-sleeved top - and the roads were completely dead. That wonderful feeling of cutting through the night was with me all the way to Isle of Whithorn and then I knew I was heading North again, much closer to my original 300km goal. As the miles clicked by, I started to think about where I would stop for the night. The road started to hug the beach for a while and I began to see the occasional camper van. All I needed was somewhere I could hide the bike out of sight and then I finally saw a section of tall, grassy dunes that would be ideal. There wasn't much prepping to do. I hauled the bivvy bag out of the saddle bag and lay it on the beach, put some legwarmers and a jacket on - as much for cleanliness as for warmth - and crawled in to lie on top of the sleeping bag. It was around 1:30 and though I didn't actually feel that tired, I wanted to get a couple of hours of sleep so that I could be up to see the sunrise. As it was, I slept fitfully, eventually being woken by an invasion of midges that I'd failed to prepare for by not zipping up the bivvy bag. No matter, a quick splash of Smidge and I got my few possessions packed away before starting off on the bike again. I was feeling pretty good too. The sun was just beginning to come up behind me and it was much cooler than it had been the day before. I watched 300km come up in 20.5 hours of riding and was pleased I'd managed to maintain a 15kph overall time. However, on the last, hilly, stretch to the Mull of Galloway I could feel my strength slowly ebbing away and I knew I really needed to get some food in me. I made it to the Lighthouse before having to stop. I figured that the optional Stranraer-Glasgow ride was not going to be enjoyable so settled in for a slow day round the Rhinns of Galloway instead. Although pleasant enough, the scenery here wasn't a patch on the previous day and, being so early, I was finding nowhere open for breakfast, or even a cup of coffee. It was therefore with some enthusiasm that I found myself hurtling down into Portpatrick. knowing I'd get a decent feed. With a relaxing hour or so spent over breakfast I was eventually happy to progress round the final section of the Rhinns round to Stranraer. With 390km on the trip computer I thought I might round it off with a wee 10km loop but I arrived at the railway station just in time to catch a train and with a two hour wait for the next one declined this opportunity to round it up. Besides, that leaves a target for the next long trip. All in all, not a bad introduction to a bit more endurance riding. Not having done even one 100 mile ride this year I was happy that I managed almost 250 and I reckon I've picked up a few wee tips of how to cope with longer, multi-day trips of this kind too. Astronomically, this has been quite an important part of the year. The summer solstice (in theory) marks out the mid-way point and it inevitably causes me to take a little time out for reflection. Fair to say that, as usual, many rides, walks and paddles I'd considered just haven't happened. Now, I know that June 21st doesn't actually mark the half-way point of summer, but there's still a feeling of it all being downhill from here to winter, so it's time I stepped up my activity level a bit. That would be all well and good but I'm now caught up in the process of moving house. Selling, buying, packing, organising will all take time and, for the moment at least, I'm unable to commit to any longer trips. That means making the most of what's around me at short notice. The other advantage of this is that I'm re-visiting some places I maybe haven't been for a while and I'm finding that I'm starting to get quite emotional with the thought that I'll be leaving them behind. Balerno has been a fantastic place to live. Access to the Pentlands is from the door whether walking or mountain biking, the A71 provides a quick route into West Lothian and Lanarkshire for the road bike and the Water of Leith path is a brilliant corridor in to town with connections to an extensive cycle path network. On 21st June I'd decided I would pop up Allermuir to catch the sunset on the longest day. With plenty of time to spare I was able to ride from Balerno, up over Maidens Cleugh, down to Glencorse Reservoir then right up over the Castellaw track before the final wee push up to the trig point on Allermuir. It's always a great view up here, with the city lying at the foot of the hill and a panorama stretching from as far as Arran in the west, past Fife and East Lothian and round to the hills above Peebles in the south. It's also always windy - and so it proved that night. I was able to get a little shelter and hunkered down for a bit awaiting the official time of sunset. As I waited, a few other hardy souls also arrived for the same reason. I like when this happens. It's always reassuring to know you're not completely bonkers. However, the weather just didn't want to play ball and even though the threatening rain clouds came to nought, the time for sunset came and went with nary a sign of its importance. With any warmth of the day fast disappearing, it was time to make my exit quickly off Allermuir, along the front of Capelaw, down to Bonaly and then past Clubbiedean Reservoir and Harlaw Farm. Fast forward to the evening of the 24th and I was again getting ready to go out for a wee ride. I'd not really planned much but I did at least have the foresight to take lights with me. Heading down the water of Leith, I picked up the cycle track from Roseburn and thence to Barnton. That led me nicely around Dalmeny Estate out to South Queensferry just as the sun was setting. Although again cloudy, it was just high enough that the sun could dip down below cloud level prior to setting, lighting up the clouds in the process. Satisfied that I'd made up for the earlier nights disappointment I headed home through Dalmeny, Kirkliston and Newbridge before picking up the canal through Ratho to Hermiston and back through Heriot Watt University to Currie and a final leg back up the Water of Leith for 56km in total. As I rode, it was getting steadily darker and I eventually gave in on the wooded banks of the canal and switched the lights on. It's a while since I've ridden in the dark like that and I'd forgotten just how much of a buzz it can be. It seems like everything around you is switching off and you concentrate on a small world defined by the pool of light from your headlamp. It's like all your senses are magnified and the endorphins start flowing. Man, I must do this more often!! So, as I await news on the relocation, I'll be drawing up other little mini-adventures and making the most of what's on my current doorstep, pleased that there is so much available in such a small area of what appears to be industrial, urban, Central Scotland.